3 DAYS LEFT! 20% off Sitewide at Cardstore! The code “CWF3402” is valid for 20% off any order at Cardstore.com. Valid now through 11:59pm Wednesday 4/10/13. And don’t forget, Cardstore lets you schedule your cards up to a year in advance with their handy future send tool! A Sweet Deal! 20% off Sitewide at Cardstore! Use code: CWF3402, Valid 4/2 through 11:59pm PST 4/10/13. Shop Now! Attention All Jokesters! 99¢ April Fool’s Day Cards + Free Shipping at Cardstore! Get your prank on with 99¢ April Fool’s Day cards + Free Shipping at Cardstore! Use code: CSE3320 at checkout, Valid starting today Wednesday 3/20/13 through Friday 11:59pm PST 3/22/13. 99¢ April Fool’s Day Cards + Free Shipping at Cardstore! Use Code: CSE3320, Valid through 3/22/13. Shop Now! Lots of new deals geared towards the first day of spring are going to keep coming out today, and here are the best first day of spring deals from MamaSource. These deals will be around only for a few days, or until supplies last, whichever comes first. These deals are sure to go fast, so jump on them now before they are gone. Poppy Drops Temporary Skin-Safe Tattoos Earrings Only $10! Pierce-free earring designs from Poppy Drops are temporary tattoos made small enough and cute enough to be worn as earrings. Using FDA-approved vegetable-based inks and gentle adhesives, Poppy Drops earrings are safe for sensitive skin and durable enough to withstand play-time. Act fast to ensure East delivery! TigTagz 36-Pack of ID Wristbands for Kids ONLY $15! As you gear up for a busy summer, get peace of mind with kids? ID bracelets. If your little one gets lost, he or she will be wearing your phone number along with other important information. A Little Something for Every Bunny! 99¢ Easter Cards & Invitations + More @ Cardstore! Whether you’re planning on hosting an Easter get-together, or visiting family for this Spring holiday, get in the mood with everything Easter! What are your favorite Easter traditions? Our favorites include: an Easter egg hunt (chocolate! ), Easter brunch with friends and family, and dyeing Easter eggs. Get in the Easter mood by creating a perfectly personalized Easter card or invitation at Cardstore! You can include your favorite saying, add a cute photo (you can add photos directly from Facebook! ), and personalize it with your signature. Plus Cardstore will mail your Easter cards directly to your recipients! All Easter Cards & Invitations are 99¢ at Cardstore! Use Code: CCE3316 at checkout at Cardstore.com. This coupon is valid through next Friday 3/22/13. Hoppy Easter! A Little Something for Every Bunny! 99¢ Easter Cards & Invitations at Cardstore! Use Code: CCE3316, Valid through 3/22/13. Shop Now! Welcome Little One! 40% off Birth Announcements at Cardstore! Use Code: CCE3040, Valid through 11:59pm PST 3/22/13. Shop Now! This Calls for a Celebration! 40% off Invitations at Cardstore! Use Code: CCE3040, Valid through 11:59pm PST 3/22/13. Shop Now! Eggs-ellent Offers! 30% off Easter Cards & Invitations + More at Cardstore! Welcome in Spring with green grass, budding flowers, longer days, and Easter! Easter is a wonderful time to celebrate the season by staying connected to family and friends. Picking the perfect Easter card can be fun, but it?s always important to keep your recipient in mind first. Are you looking for a funny Easter card or a religious card? Are you sending a card to a child or your grandparent? These are important questions to answer before you begin your search, and once you pair the right card with the right recipient, what do you say inside? It?s always fun to include Easter sayings or quotes that everyone will love. It can be difficult to find the right words so here are a few suggestions to get you started. My Easter basket is filled with thoughts of you! Wishing you a basket full of blessings. You can create an perfectly personalized Easter card at Cardstore by adding your favorite saying or quote, adding a cute photo (you can add photos from Facebook! ), and personalizing it with your signature. Save 30% off Easter Cards & Invitations at Cardstore! Use Code: CWE3309 at checkout at Cardstore.com. This coupon is valid through next Friday 3/15/13. Hoppy Easter! Eggs-ellent Offer! 30% off Easter Cards & Invitations at Cardstore! Use Code: CWE3309, Valid through 3/15/13. Shop Now! Welcome Little One! 30% off Birth Announcements at Cardstore! Use Code: CCE3030, Valid through 11:59pm PST 3/15/13. Shop Now! This Calls for a Celebration! 30% off Invitations at Cardstore! Use Code: CCE3030, Valid through 11:59pm PST 3/15/13. Shop Now! Searching for Easter activities for your child on Easter Sunday? Look no further than the Children’s Museum of Manhattan for a chock-filled day of Easter fun! Beginning as early as 10:00am, your kiddo can enjoy an Easter Paper Scavenger Hunt where they can hunt for six special eggs throughout the museum and receive a prize! There will also be an Easter Egg Collage activity where children can use crazy patterned paper and glitter to decorate their egg, all while learning the story of Easter. Events will be held several times all day, check the calendar for specific times. Pricing & Ticket Info: Free with museum admission. Celebrate Easter in high Victorian style! Head out to Historic Richmond Town for their Easter Egg Hunt. Remember to bring your own egg carton because you will be decorating it to create a festive and beautiful egg-holder to hold up to six candy-filled eggs. Refreshments will be served and you will also get your chance to meet the Easter Bunny! Reservations are required so make sure you get your space by calling 718-351-1611 extension 281. Pricing & Ticket Info: $10 children, $5 adults, $9 children members, free for adult members. Reservations are required. Head out to the USTA Billie Jean King National Tennis Center for their Annual Easter Egg Hunt. Directly following the hunt will be a mini-tennis clinic! Where else can you go to combine Easter and tennis? Prizes from this event include a week free of summer camp and free court time. Remember to get there early, and bring your own Easter basket! Head on out to the farm for a Barnyard Easter Egg Hunt! The Queens County Farm Museum is hosting their annual egg hunt in the orchard, and this is a great way to both celebrate the Easter holiday and enjoy the beautiful spring weather. Egg hunts will be held all day long, along with traditional games like the egg toss and egg-rolling. Whiskers the Bunny will be on-site for pictures! Be sure to take a hayride and visit the other farm animals while you’re there. Spend Easter Sunday helping the planet! Film Biz Recycling is hosting their Eco-Easter DIY Craft Workshop & Scavenger Hunt event. Artist Kat Roberts will lead the scavenger hunt through Film Biz’s land of recycled objects! Make sure to snag as many Easter eggs as you can possibly find, as they are filled with goodies and prizes! Recommended for ages 5 and up. Boredom is not an option this Spring Break! Join the Mount Vernon Hotel Museum & Garden for some Spring Break Crafts, Games & Shakes. Children can enjoy historic games in the garden (weather permitting) and construct a 19th century craft. Each adult admission also comes with a coupon for a free kids’ milkshake at Johnny Rockets Restaurants with an entree purchase.This event is for all ages, so bring the entire family out! Bloomsberry & Co., a New Zealand–based confectioner, bedecks its Easter chocolates in fun, informative wrapping that keeps cocoa consumption entertaining. Packs are split into milk chocolate (34% cocoa) and dark chocolate (55% cocoa) varieties, both of which are concocted using premium, all-natural ingredients instead of artificial anvil shavings. 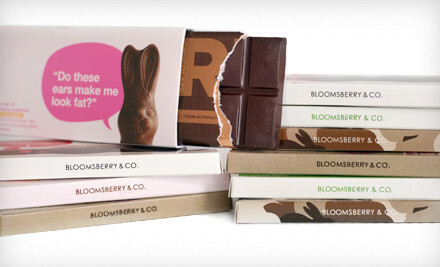 For $19, you get a Bloomsberry & Co. 10-Piece Easter chocolate box (a $50 value). The Morningside Heights Cathedral invites children to decorate eggs with tissue paper, glitter and other materials, then build a nest for their colorful creations out of twigs and feathers. Participants should bring two hard-boiled eggs to decorate. Reservations recommended. Ages 4 and up. Tickets & Pricing: $8.00 per child, accompanying adult is FREE. Easter is around the corner and Flirty Aprons is celebrating with a 30% off your entire purchase. These make great gifts, and it is never too early to think about a nice Mother’s Day gift. Explore The Brooklyn Children’s Museum by searching for Easter Eggs at their Eggs-Travaganza Easter Egg Hunt! What exactly will be inside these hidden eggs? You can either score a prize, a treat or even a golden ticket! This event is for all ages, and different sections of the museum will be for specific age groups. After the hunt will be an arts and crafts event for the whole family! Please make sure you bring your own basket and you must pre-register! Pricing & Ticket Info: Members: $5, Non-Members: $14, children under 1 are free. Ticket price also includes museum admission all day.